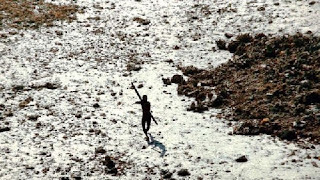 We had brought in gifts of pots and pans, large quantities of coconuts, iron tools like hammers and long knives… But the Sentinelese warriors faced us with angry and grim faces and fully armed with their long bows and arrows, all set to defend their land. Few pictures exist of these elusive people. What we know for sure is that they like their privacy and will summarily deal with any intruder whom they regard as a threat. Last month, an American missionary called John Allen Chau was killed by tribesmen when he set foot on their island, North Sentinel, one of the Andaman Islands. He shouldn’t have been there – it’s a protected area and people can only enter by special dispensation from the Indian government. 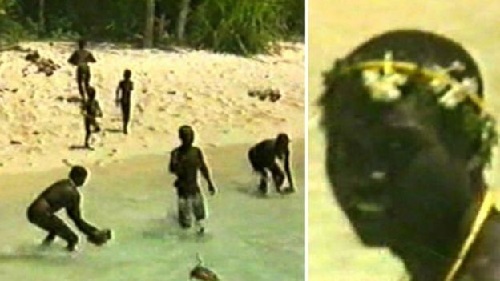 But he had bribed some fishermen into taking him. Mr Chau was described as an ‘adventurer missionary’. I take this as an upgrade of the ‘explorer missionary’ of bygone times when there were still chunks of the world map that were unexplored or very scantily explored. Among those ‘explorer missionaries’ was David Livingstone – probably the last of the genre of any note– the remains of whose compound I visited at a place called Kolobeng while living in Botswana. Livingstone was initially backed by the London Missionary Society (LMS) and later also by government and commercial parties who had an interest in what his explorations north of the Zambezi would reveal. Livingstone’s main personal driving force was to discover the source of the Nile. I’m not casting aspersions on the man’s character or motives – by all accounts, he was a thoroughly decent bloke who genuinely cared for African people and did a lot of good in his role as a medical doctor. But to call him a ‘missionary’ in the Sunday School sense of the word is misleading. A lot of indigenous peoples appeared to take the bait – there were often inducements involved such as steel axes and blankets. 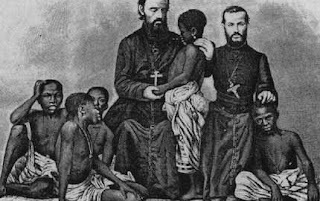 But the stories of mass conversions that some missionaries came back with have to be put in context. When tribal peoples ‘convert’ to a foreign religion such as Christianity, they do not generally ditch their old belief systems. Primitive peoples recognise the existence of the gods of other peoples; to them, each ethnic group has its own deities which are as real as their own. If another people have superior technology and are militarily and economically stronger, then it seems a good idea to get on side with that people’s god(s), especially if the invitation to do so is extended. But you don’t do so at the expense of your own tribal god(s) – who could, after all, get nasty by sending disease, making the crops fail or putting a hex on your hunting gear. The end result is a hotchpotch of endogenous and exogenous beliefs – maddeningly frustrating to the uninformed outsider as the indigenous person flits from the one to the other in what seems a game of conceptual musical chairs. By the late19th century, the emphasis of major missionisation organisations such as the LMS was discernibly shifting from the other-worldly to the this-worldly domain. Education became a focal activity as a means to help native peoples modernise and improve their conditions of life. They even got involved in politics – for instance, LMS missionaries made it possible for a delegation of Botswanan paramount chiefs to visit London in 1878 to petition for protectorate status in the light of expanding German influence in South-West Africa and growing incursions by Boer raiding parties. The upshot was the protectorate of Bechuanaland (renamed Botswana upon independence in 1966). I work at the American University of Beirut (AUB), set up in 1866 as the Syrian Protestant College by three American men routinely described as ‘missionaries’. But their operational objective was neither to Christianise (given that Christianity came from this region, that would be taking coals to Newcastle!) nor to Protestantise. 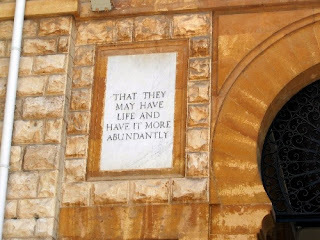 The raison d’ être of AUB since its inception, engraved on the main entrance gate, is “That they may have life and have it more abundantly” – a quotation of biblical origin, but with a here-and-now thrust. The modern ‘Christian missionary’ is not usually disseminating Christianity as such but rather a particular narrow sectarian version of it, a message often spiked with side-swipes at other Christian sects from whom they poach converts. The US fundamentalist fringe operates a plethora of ‘missions’ in Central and South America and in Asia that aggressively peddle their religious ideologies to the point where some governments have had to take steps to curtail their activities because of the offence and division they were causing (not to mention very shady money-raising practices in some cases). Here in Lebanon, as in other Middle Eastern countries, the law frowns upon open religious proselytising. Accosting people in the street with religious tracts, or door-knocking Mormon-style, invites trouble. I sympathise with this stance, especially where the proselytisers are foreigners – society here is fragmented enough already and the last thing we need is outsiders imposing yet more fracture lines. Not long ago, I came across a couple of young female Korean ‘missionaries’ stopping people on the street in Hamra (the suburb of Beirut where I live) and handing out leaflets produced by some American fundamentalist outfit. I tried telling them they were breaking the law but their English wasn’t up to any meaningful exchange. I’ll wager they don’t speak a word of Arabic either. Getting the dirty work done by dewy-eyed Korean girls presumably on tourist visas tells you lots about the ethics of the ‘Christian missionary’ bunch of Yank shysters running that little show. I haven’t seen that crowd since – with any luck they were dobbed in. We occasionally hear of Western ‘missionaries’ ‘working’ in various Middle Eastern and Asian countries crying foul when they are apprehended or deported. Good riddance to bad rubbish is what I say. None of this is to detract from the sterling work carried out by the missions of some of the mainstream churches in many developing countries. I developed a high level of respect for the Catholic education system in PNG, and they do a lot of social work too. I did not think of the expatriates in the system (mostly Aussies) as ‘missionaries’ in the classical sense at all. At the same time, I watched with mounting despair the increase in the level of activity of various imported tin-pot ‘evangelical’ outfits spreading their poison. As for Tonga’s descendents, my simple advice is: leave them be. The fellow trying to down that chopper with his bow and arrow is sending a loud and clear message: this is our turf and we demand the right to control our own destiny. By wiping out that intruder, they were repelling what could have been the start of an invasion as they saw it. Maybe all that will change in time – their own sweet time, certainly not that of foreign religious cultists looking for new conquests.